In the last post I mentioned my dissatisfaction with my own inability to loosen up and really experiment when doing the drawing/book making exercise on the first afternoon. That feeling surfaced again on the second day and really would linger for the rest of my time. On the second morning we were all given a beautiful piece of recycled wool to prepare for dyeing. We were instructed to add to it some of the fabrics we had brought along to experiment with how they would take the different dye materials. I was still thinking about the seaweed on the beach and I decided to add some vintage fabric from my stash that had a polka dot sewn onto it. I cut it into “seaweed-y” shapes and sewed it to my wool strip. But I stuck with the one fabric choice and I was very controlled about how I placed it. I looked around the room, other people were adding random bits of random fabrics with wild abandon. They were sewing fabulous marks with many kinds of thread. It was too late to change my own work and embrace the process so at that point I had to let it ride and hope the dye pot would add some magic. I was disappointed with myself for not leaning in to the process and trying to control the final result. After lunch we headed out to gather local materials and the bundles went into their bath. I decided to just stick with my plan at this point and dyed mine with a bunch of different kinds of seaweed collected from the beach. When it was time for the first reveal I loved the colours and I really loved the way the seaweed had embossed my wool, but my added fabric didn’t take the dye well and many of my threads didn’t dye either. My stitches were too petite and didn’t read well against the dyed wool. 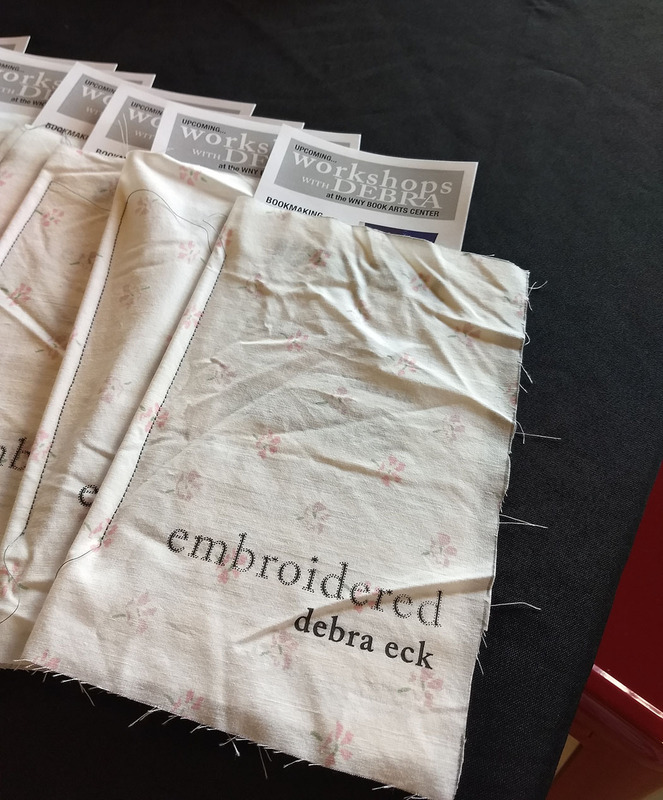 I wasn’t disappointed with the workshop – but I was sad about my own failure to try and LEARN something instead of trying to control the outcome. Eventually we would sew those wool strips into a tsunobukuro style bag. I was delighted to find that the finished bag was the perfect size to carry my new sketchbook! Here’s the finished bag a few weeks later after being used as a much loved container for my sketchbook. Its growing on me, and I think I will keep working into it slowly, letting it evolve. I’m hoping by keeping my sketchbook in there it will remind me to let myself let go a bit more! Last step to finish by bag will be to add the great button I brought on the island (shown in the last image). Hopefully I get around to that over break! In the next post I’ll show you the results of me trying oh so hard to relinquish control. Until then Happy New Year! In November I had the great fortune to travel to the magical Orkneys to take a workshop led by India Flint and Alison Mountain. This was largely due to the generosity of my amazing and long suffering hubby (who gave me the trip as a birthday present), but also because two local organizations had faith in my work, and helped defray part of the costs with some grant funding, so a huge thank you to the United Arts Appeal and the Allegany, Cattaraugus, Chautauqua Fund for Women for their support. It’s really hard to find the words for my experience there on the island, but I’m going to give it a try. We stayed in the charming Woodwick House, that’s the sea right at the end of the garden! As an introvert I always approach these kinds of workshops with equal parts excitement and dread. I don’t lack confidence in my work or my ability to learn new skills, and I am not shy, but I find interacting with people I don’t know exhausting and a tiny bit terrifying. I needn’t have worried. Talk about finding your tribe. It was one of the easiest group of “strangers” I have ever had the privilege of spending time with. From the first meal together it was clear that an unusual chemistry was at play, and I was able to relax into the work without trepidation. I really want to thank ALL the amazing artists for being so open and grounded, but I especially want to thank Jo, who took my awkward self under her wing and smoothed the way. She has a truly unique gift for seeing people and facilitating communication – so big hugs Jo! I don’t want to bore you with a blow by blow description of everyday – so I am just going to share a few highlights. The first day we headed out after breakfast to “shake hands with a place” as Andy Goldsworthy has so eloquently put it. We spent a blustery few hours outside wandering, collecting impressions, sketching, I’m sure like me many people took some photos. Alison provided us with these adorable little vintage country dance books to use as a sketchbook, it had never occurred to me to draw in a printed book before, but it was an interesting challenge to marry an impression with an existing page! In the afternoon Alison led us in a workshop to try and capture those impressions. We worked with a variety of materials including some incredible natural inks. 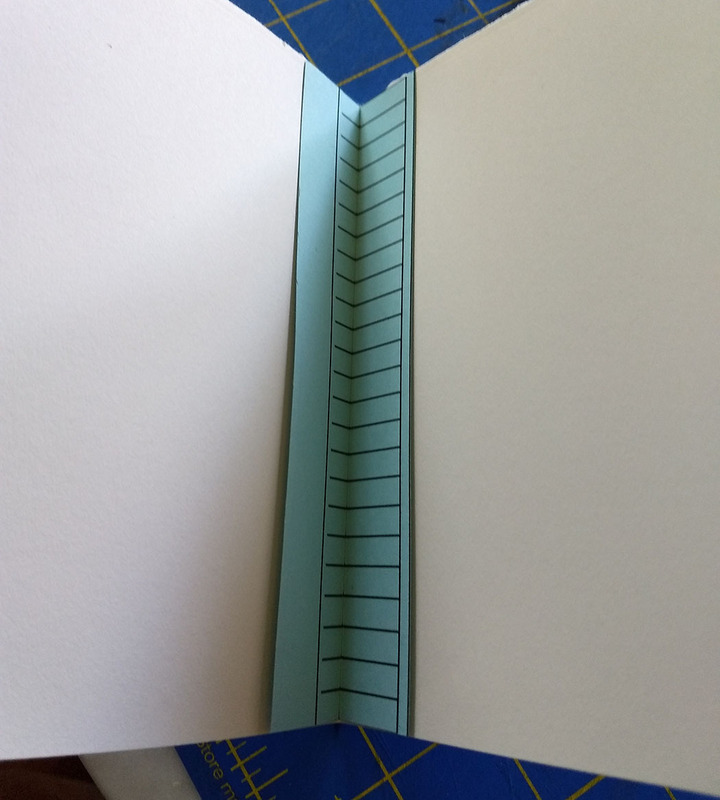 We began by working on a large sheet of paper which was then folded to make a simple book form. Then we worked back into the pages the folding created. I was amazed to find myself working comfortably in a pretty crowded room without “walling myself in” with my stuff. My final result looks to me like my work, but I can clearly see the influence of the place and the process. I was envious of the artists who could really work freely – I struggle to just make marks and be loose – and this was a feeling that came back to me again and again during this workshop and is something I am really hoping to carry into the new year. 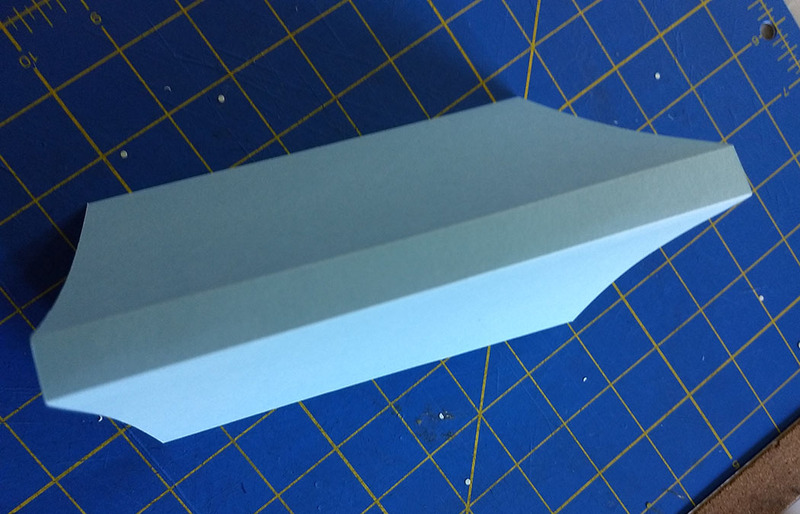 The first marks were pretty loose, but the end result seems a little tight and maybe overworked? The first day was so rewarding, and the experience would only keep getting better! Stayed tuned for more! 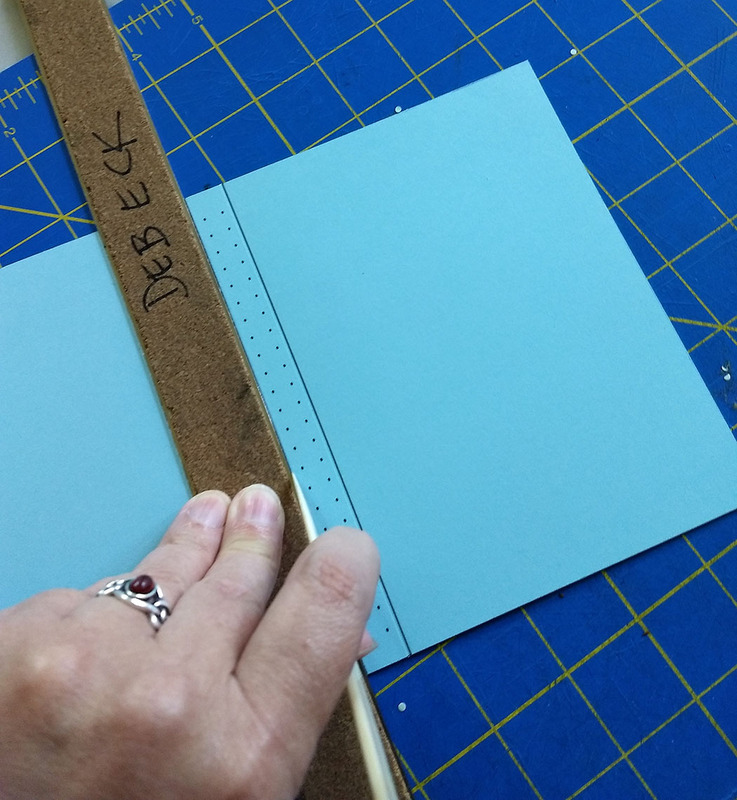 Begin by cutting out the pieces from the template. 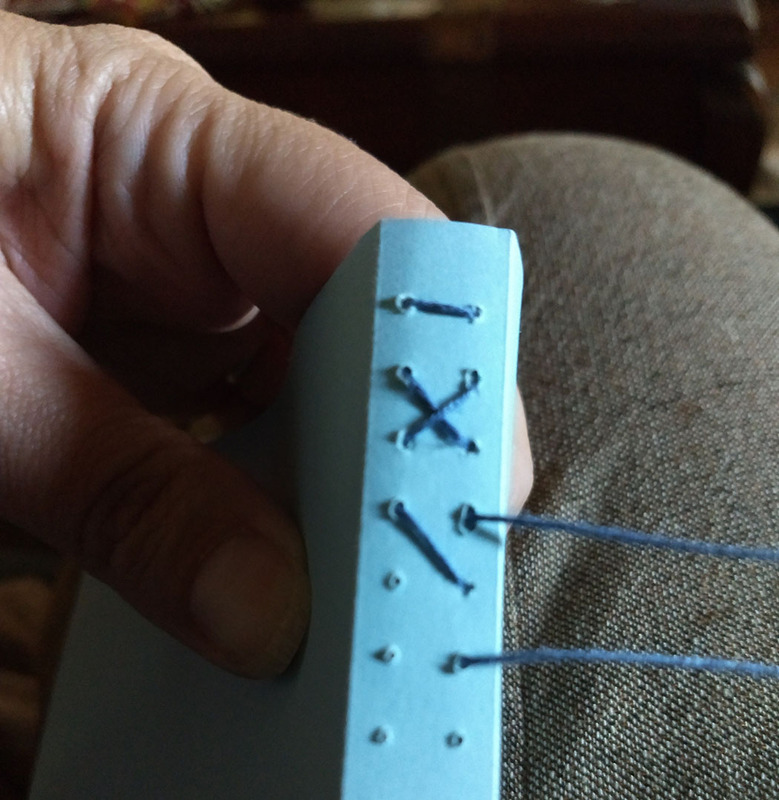 To begin sewing enter the spine at the head of the book. 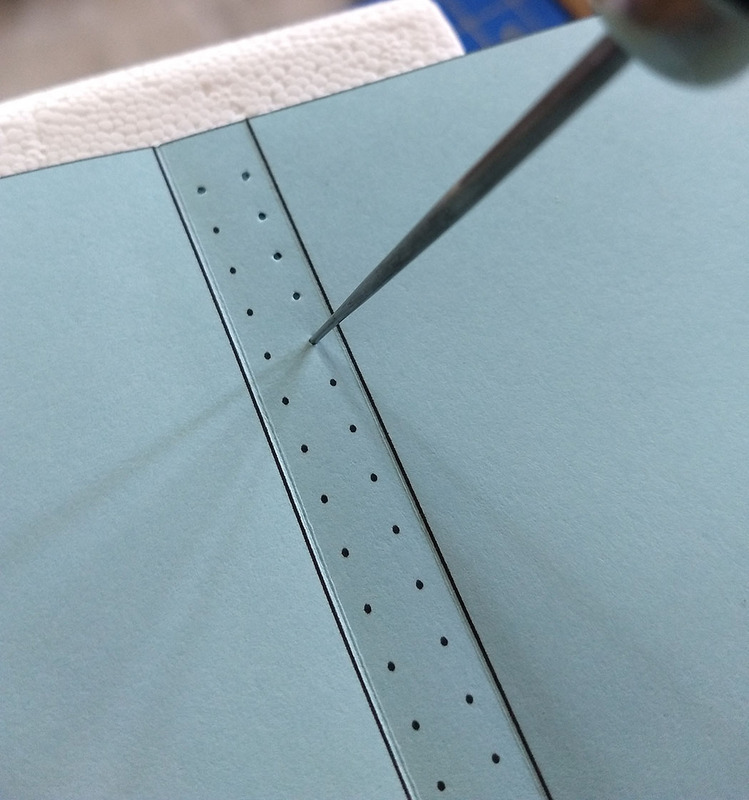 Each needle should go into the first sewing station, through the signature to the inside of each. 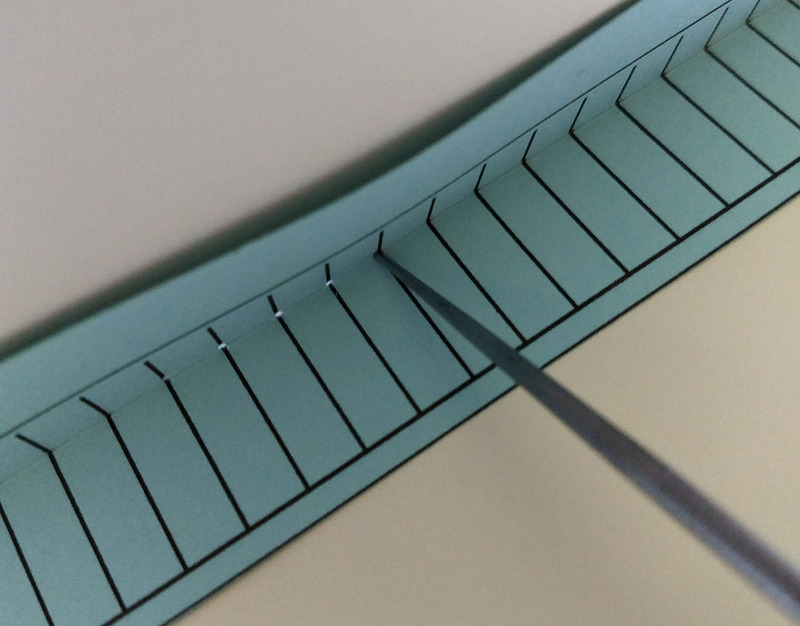 Then take each needle out the second sewing station in each signature, back out to the outside of the spine. I always sew left to right because I am right handed, but as long as you are consistent it doesn’t really matter. 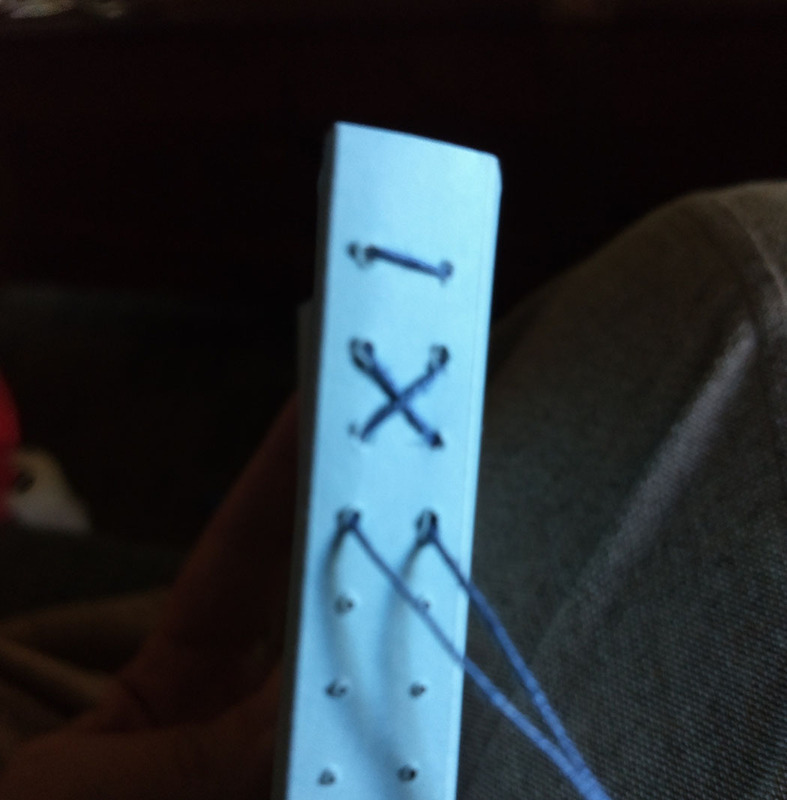 With the spine facing you, take the needle in the left hand row and take it down into the third sewing station in the right hand making a diagonal stitch across the spine. 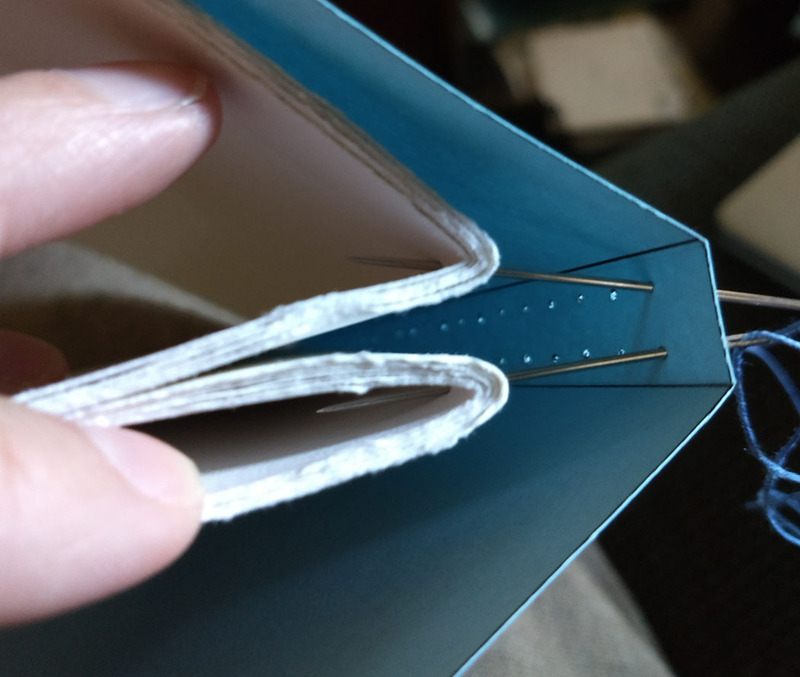 At the end, sew up to the previous sewing station, but only through the signature (NOT the cover) tie off the two ends in the gutter and trim. 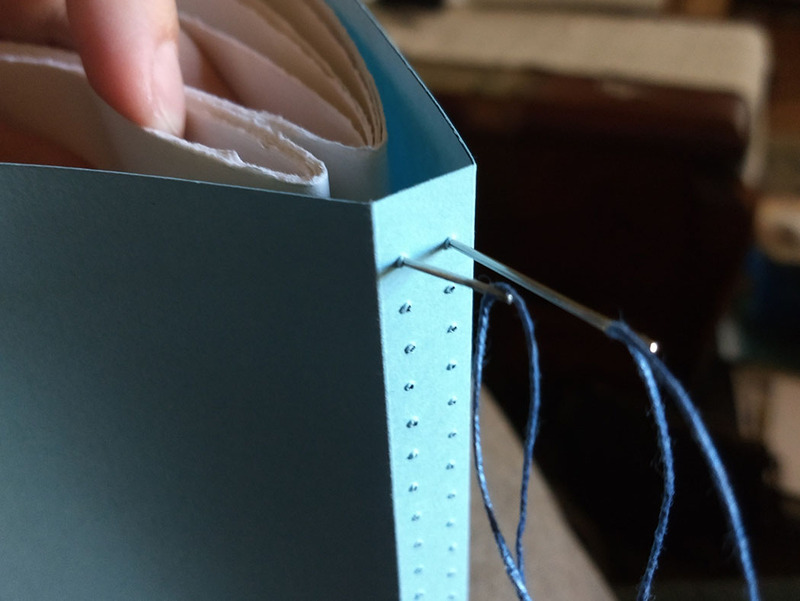 You can increase the numbers of signatures in pairs and sew into a larger book, like this one. 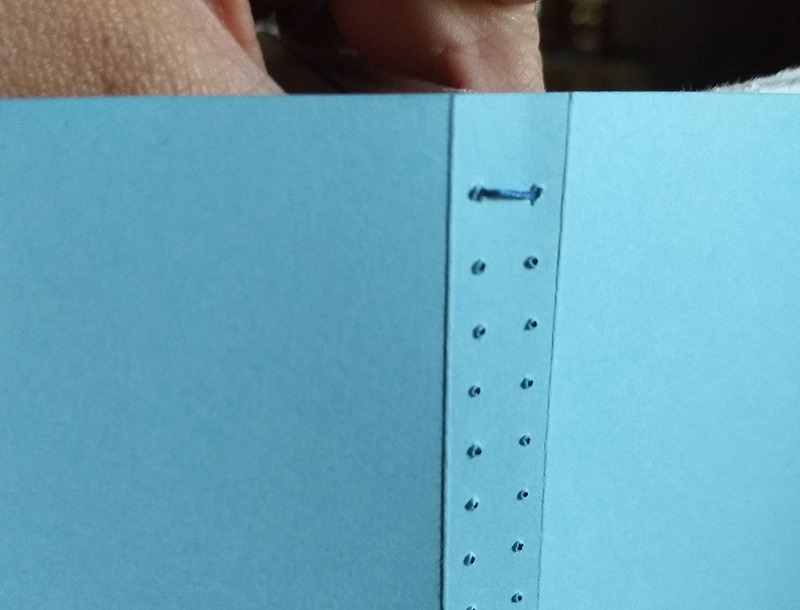 You could also sew between signatures 2 & 3 in the same manner if you wished. 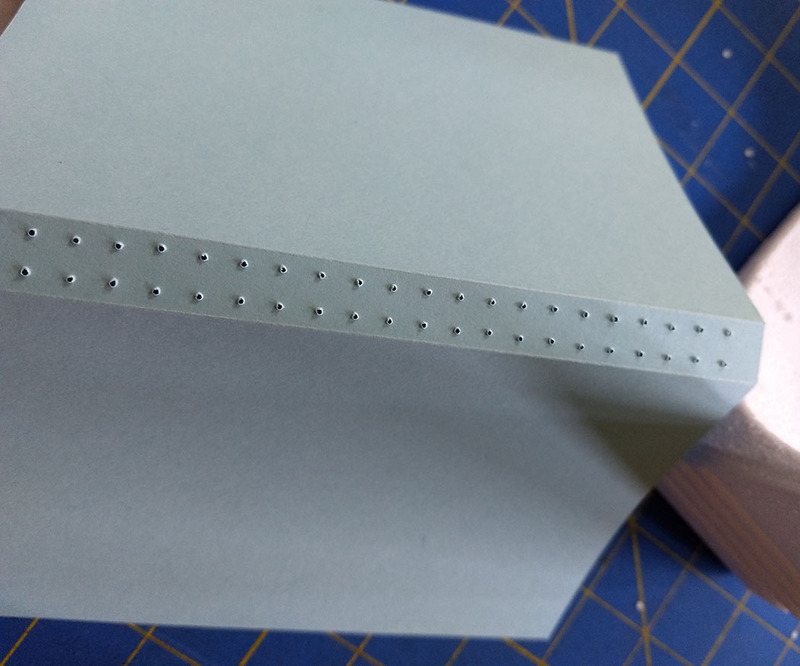 I chose this binding for the workshop because learning it gave me the idea to experiment with making samplers as bindings, which lead to making bindings using lots of other kinds of embroidery – especially blackwork embroidery. Its been a pretty perfect day – now I am relaxing at home with tea and chocolate. Taking a few minutes to let all my good fortune wash over me, before I get back at it! Wowsers! What a week that was, the unveiling of the Chautauqua Prize would have been enough for one week, but hot on the heels of that came the grand reopening of the gallery where I am the curator, 3rd on 3rd, part of the Reg Lenna Center for the Arts. It was jam packed as this coincided with Lucyfest and the opening of the new national comedy center. The exhibition is a fun one, images curated from an Instagram contest of images of Jamestown, NY. That’s the work of Paige Kleinfelder behind me on the wall. It’s exhausting just making that list! Tomorrow I am going to clean my house and studio! Cat’s out of the bag, finally! 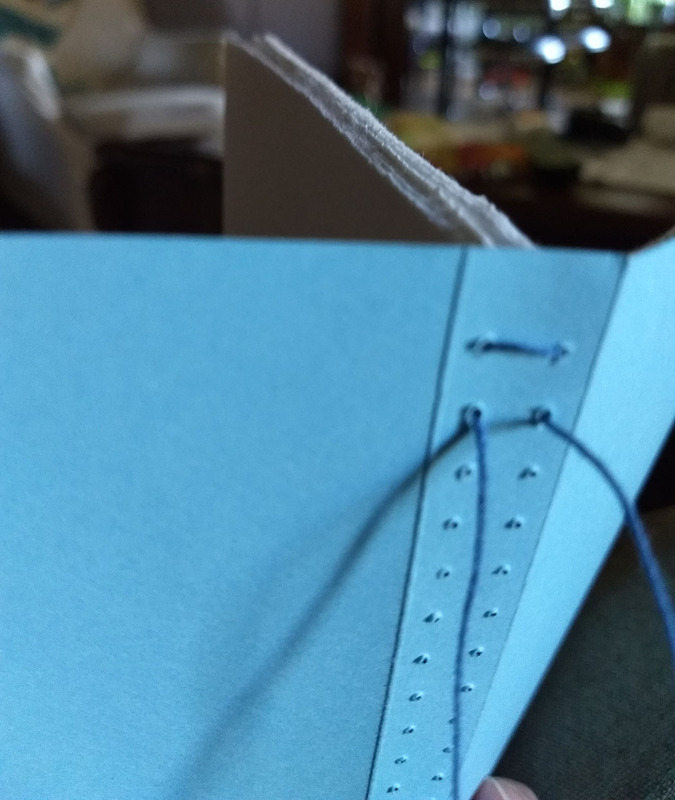 So in addition to getting new work ready for my new solo exhibition, opening tonight at the Crary Gallery in Warren, PA, I have also been working on a top secret project. 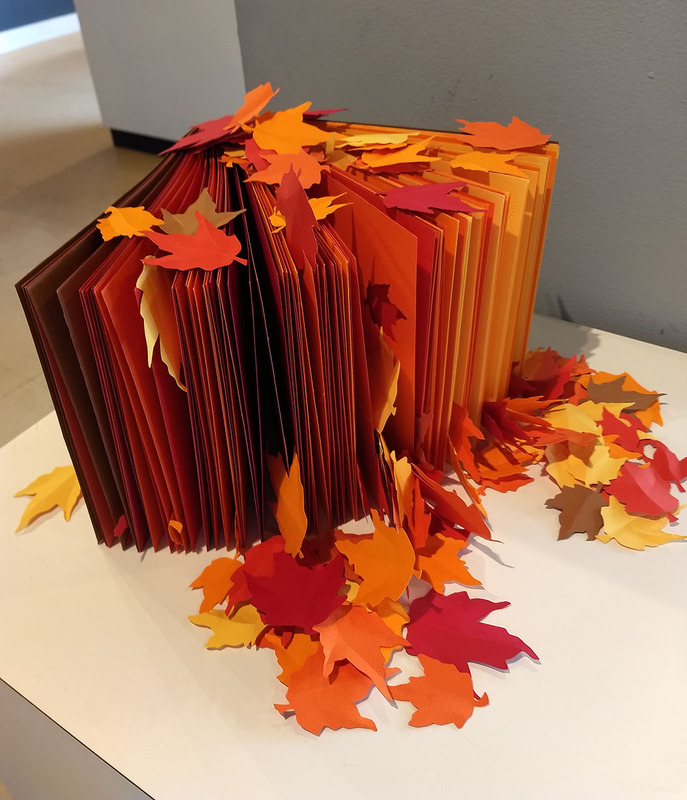 I live near Chautauqua Institution, and each year they commission a local artist to make a unique art object in response to a book which has been awarded the Chautauqua Prize. 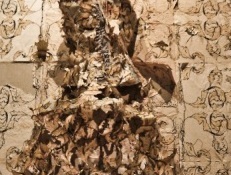 This year I was chosen to create something in response to the winning book, The Fact of a Body. If you haven’t read it I think it’s a must read. I don’t want to give away the whole book, but it involves two stories, a murder and a memoir, which overlap and diverge. Along the way the reader has time to consider their own opinions about some very deep difficult issues, among them, the death penalty. For me though the overwhelming theme is the individual humanity and the unique narrative of each person touched by the story(s). The structure of the narrative in the book immediately suggested a flag book. The overlapping elements of the narrative in the book seemed ideally suited to the interleaved flags of this book structure. As regular readers of the blog know much of my work involves redacting and altering existing texts, and as a core idea of the narrative is the elusiveness of a single truth, I really hoped the author wasn’t going to e distressed by my hacking her fine book apart and constructing yet another version. When selecting the passages to include I was drawn to those which left a vivid picture in my mind, passages that evoked in me a lasting retinal impression or a strong emotional connection. My selections were personal and perhaps not indicative of the arc of the authors narrative. 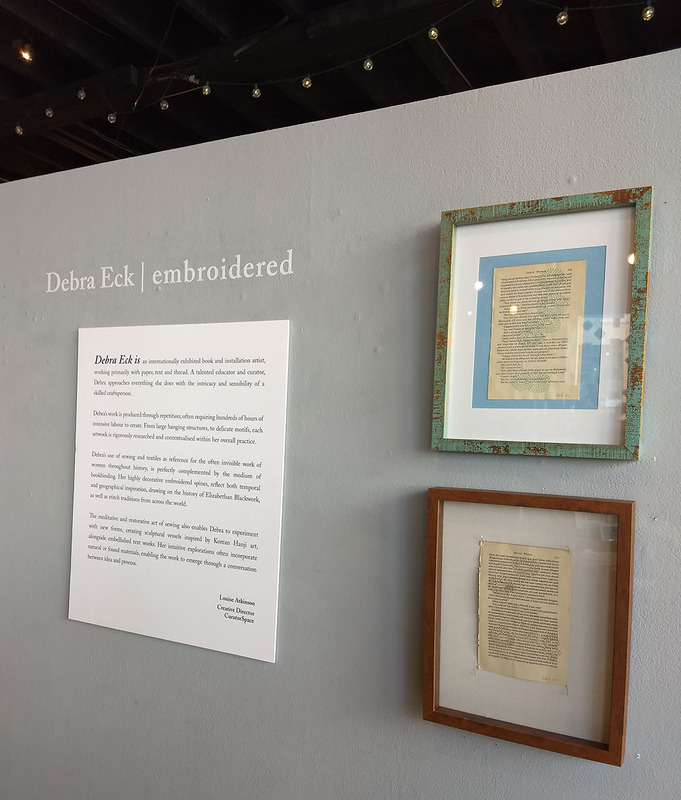 The use of translucent vellum to create the flags allows for the text to be experienced in layers and for the various elements of the story to literally overlap visually. 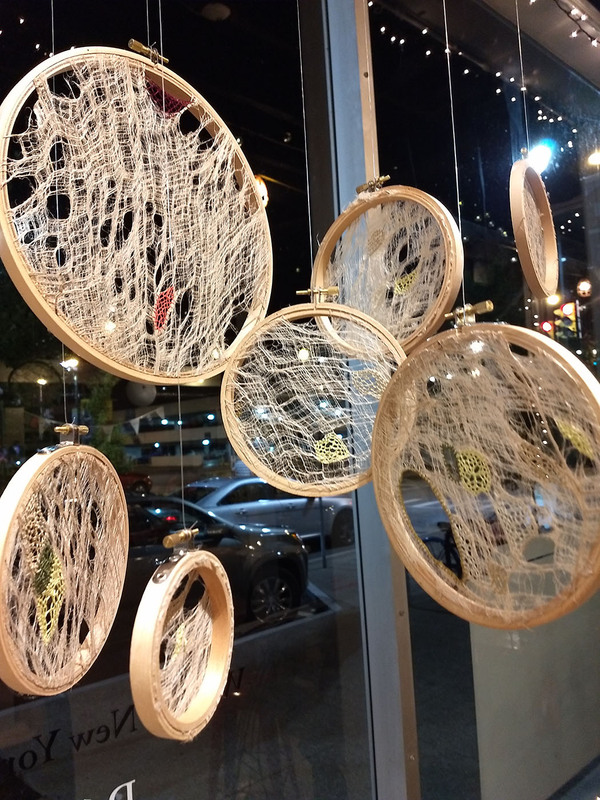 I used sewing as a form of mark making, to emphasize elements of the text, primarily names, and the various physical bodies contained in the original work. I also edited out some elements of text using Boro type stitching, the words are still partially visible beneath the sewing. Boro is a tradition Japanese mending technique. The word itself means rags or scraps of cloth. I chose boro because it seemed that all the characters in the work are patching themselves together, layering new versions of themselves over the old, and also, because the make- do and mend aesthetic seemed appropriate to the tenacity of many people in the narrative. I hope the finished book reflects the fragility of the stories and bodies in the original text, and that the author forgives me for rummaging about in her ideas this way. It really was a singular honor to be a part of celebrating this amazing book. I’m glad to say that Alexandria was pleased with the book. Here we are together at the awards dinner. Congratulations Alexandria on the well deserved honor. And if you are still reading, for yourself a favor and read her book! Okay back to the studio, I need to find my bench, it’s a mess in there, well the whole house really!